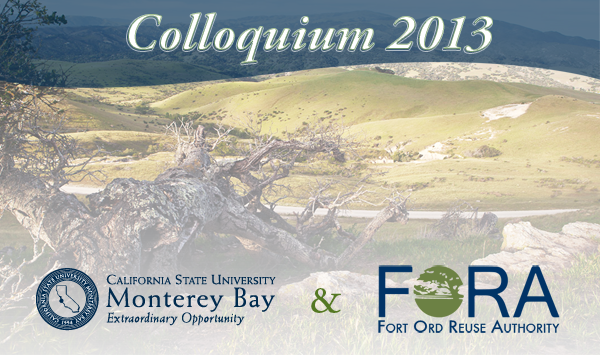 A two-day Colloquium, held on December 12 and 13, 2013, hosted by California State University-Monterey Bay (CSUMB and the Fort Ord Reuse Authority (FORA) provided a unique opportunity for the public to hear from and interact with nationally recognized experts on topics of economic development, innovation clusters, blight removal and remediation, urban and regional design, community collaboration, and national monuments as economic engines for the region and also emphasized how important communication and partnerships are within the Central Coast region. Dr. Ochoa has served as president of Cal State Monterey Bay since July 2012. Before coming to CSUMB, he had a long career as a faculty member and administrator at four other Cal State campuses and served for two years as assistant secretary for higher education in the Obama Administration. Summary: Places the Colloquium in historical and geographic context. Emphasizes the value and opportunity of the Colloquium to consider new perspectives. Encourages participants to engage in productive dialogue. Dr. Kamath has held academic and administrative positions at leading universities in the United States, Canada, Asia and Europe. Previously, he was an entrepreneur as a co-founder of three startups, pioneered a number of academic startups and worked for leading international firms in the energy equipment and consumer goods areas. He has published more than 80 articles in leading peer-reviewed scholarly and trade journals and is the author of three books. Summary: Data and experiences with innovation clusters around the world. Characteristics of regional innovation clusters and suggested lessons for the Monterey Bay Area region. Larry Samuels has more than twenty years of executive leadership experience in the electronics and technology industries, with companies such as Atari, Communities.com, Vicom, and Creative Labs. He has led or had executive participation in three successful IPOs, countless private and venture financings, and has funded varied early stage technology incubators. In addition to building several world class leadership teams and organizations, Larry has co-founded worldwide industry consortia, helping establish global standards and brands. With experience in all sectors of the technology marketplace, including Net-based social media development and deployment, retail and distribution, software/hardware research and development, overseas manufacturing and social network deployment, he brings a unique set of expertise to companies and individuals seeking to achieve new levels of performance, establish and/or reposition their products services or brands, or develop new relationships and markets. Larry holds a MA and dual track PhD from the Graduate School of Education at Stanford University. Summary: Talks about the role of higher education in economic development. Focuses on the dyanmics of the Monterey Bay Region and is suite of higher education institutions. Bud Colligan is Founder and CEO of South Swell Ventures, a private investment firm in Santa Cruz, CA, and partner at Accel Partners, a global venture capital firm. Bud sits on the board of directors of Lynda.com and Yodlee and is an investor in and adviser to Days of Wonder, Wheelhouse and NextSpace. Bud was an investor and Board member at CNET Networks, acquired by CBS; Brightmail, acquired by Symantec; and S3 Corporation, acquired by Via Technologies. In 2013, Bud was honored as an Outstanding Director by the Silicon Valley Business Journal and San Francisco Business Times. Prior to Accel, Bud co-founded Macromedia in 1992 through a merger of Authorware and Macromind-Paracomp. At Macromedia, Bud served as CEO from 1992-1997 (taking the company public on NASDAQ in December 1993), and as Chairman until July 1998. During Bud’s tenure, Macromedia grew from a start-up to over $100 million in revenue. In 1996, Bud was named Software Entrepreneur of the Year by Ernst and Young. In 2005, Macromedia was acquired by Adobe Systems for $3.4 billion. Summary: Observations on regional economic health indicators and strategies for growing small to medium sized businesses in the Monterey Bay Region. Ms. Ott manages the reuse and redevelopment of 870 acres of the former Naval Air Station for the city of Alameda, including overseeing property conveyance and environmental cleanup by the Navy; the local and regional planning, entitlement and regulatory process; disposition and development transactions with developers; and its $12 million leasing program. Prior to working at Alameda Point, she was vice president at Economic & Planning Systems, a land-use policy and real estate economics consulting firm. She has a Master of Public Policy degree from University of California, Berkeley. Author and consultant Peter Katz is a leading proponent of the New Urbanism, an urban design and planning movement that the New York Times called "the most important phenomenon to emerge in American architecture in the post-Cold War era." Peter played a key role in shaping the movement as founding executive director of the Congress for the New Urbanism. He's author of a seminal book on the subject, The New Urbanism: Toward an Architecture of Community (McGraw-Hill, 1994). Peter provides strategic marketing and consulting services to communities seeking to implement New Urbanist principles in mixed-use and transit-oriented community development projects. He previously served as Planning Director for Arlington County, VA and director of urban planning and smart growth for Sarasota County, FL. Peter is a founding board member of the Form-Based Codes Institute. He holds a degree from The Cooper Union in New York where he studied architecture and graphic design. Summary: Presents data supporting the idea that infill development in downtowns yields higher tax value for Cities and Counties. Makes the case for tighter linkage between regional plans and zoning using Form-based code as the mechanism. Mary Jo Waits is the Director of the Economic, Human Services and Workforce (EHSW) Division at the National Governors Association Center for Best Practices. Governors rely on the NGA Center to provide tailored technical assistancefor challenges facing their states, identify and share best practices from across the country, and serve as an information clearinghouse for an array of gubernatorial initiatives. The Center’s EHSW division focuses on developing innovative policy options and promoting best practices across a range of current and emerging state issues, including economic development, innovation, workforce development, and employment and social services for youth and low-income families. Summary: Focused on creating conditions for innovation. Lessons learned from her role leading the National Governors Association Economic, Human Services & Workforce Division. Noted competitive climate for innovation hub creation around the world. Sited examples of innovation hubs around the country. Since 2007, Ms. Timmerman has been responsible for the administration of major and minor capital improvement projects at CSUMB. Timmerman assures compliance with CSU, state and federal requirements for new construction and renovation projects. She has a Bachelor of Science degree in Architectural Engineering with a minor in Construction Management from California Polytechnic State University, San Luis Obispo. At CSUMB, she has managed projects that have significantly transformed both the physical campus and the experience of those who work and study here. Some of these projects include the North Campus demolition (blight removal), the University Center roof replacement, the new $43 million Business and Information Technology Building, and Inter-Garrison Road improvements. Mr. Seymour joined RKG Associates, Inc. in 1987. His primary area of expertise includes economic analysis, financial forecasting, strategic planning, feasibility analysis, real property valuation, and project management. Mr. Seymour has over twenty-five years of extensive experience in economic development, the socioeconomic evaluation of major projects, business and community planning and redevelopment financing. His responsibilities include management of the firm's economic and financial oriented consulting services, including the appraisal and research functions. Mr. Seymour has an AB in Economics/Civil Engineering from Brown University, Providence, Rhode Island, and a Masters of Business Administration (MBA) from the University of New Hampshire. Summary: Lessons learned from BRAC process. Differences between large & small, rural & urban projects. 45+ projects around the country. Market forces: location, real estate cycle, 20+ years. Funding: where is money coming from? Access to capital. Expertise: experience/knowledge, and political support. Environmental Conditions: complexity, expertise of decision-makers. 4 case studies: Pease AFB, Chanute AFB, Walter-Reed AMH, Niagra Reserve. Jim Musbach, Economic and Planning Systems, Inc.
James Musbach is a Managing Principal with Economic & Planning Systems, a land economics consulting firm with offices in Berkeley, Sacramento, and Denver. Mr. Musbach has over 30 years of experience as a consulting land economist, and has been involved in the planning and implementation of projects throughout the United States ranging from large-scale master plans and complex redevelopment and reuse projects to individual real estate projects and the formulation of land use policy. He has developed innovative approaches to redevelopment and reuse strategies and financing programs that can overcome the financial hurdles to successful development, and is a frequent writer and speaker on urban economic issues. Summary: Blight removal and redevelopment are interconnected. Common challenges: Environmental contamination, infrastructure needs, market support for new uses, politics, institutional capacity, access to capital, private sector. Recession impacts. Water supply issues. Regional coordination. Extension of FORA. Funding alternatives. Tax increment. Efficiencies from contracting coordination. Lenny Siegel has been Executive Director of the Center for Public Environmental Oversight since 1994. He is one of the environmental movement’s leading experts on both military facility contamination and the vapor intrusion pathway, and for his organization he runs two Internet newsgroups: the Military Environmental Forum and the Brownfields Internet Forum. In July 2011, Siegel was awarded U.S. EPA’s Superfund Citizen of the Year award. Siegel serves on numerous advisory and technical committees including, the Moffett Field Restoration Advisory Board, the National Research Council's Committee on Future Options for Management in the Nation’s Subsurface Remediation Effort, and the California Brownfield Reuse Advisory Group. Siegel is founder of the Save Hangar One Committee, working to restore and reuse Moffett Field’s landmark dirigible hangar. Summary: Methods for minimizing risk in munitions cleanup. Geophysical classification as an efficiency improvement method. Considerations for regulators. Significant projects developed and managed by Mr. Guy related to preservation and culture include the Gainesville Eco-History Trail Design Competition funded by the National Endowment for the Arts New Public Works Program, and a six-year effort for the community-based design and planning for the rehabilitation of the Old Gainesville Depot, Gainesville, FL partially funded by the Florida Bureau of Historic Preservation. Brad is also an organizer and juror for US EPA and AIA Lifecycle Building Challenge in 2007, 2008 and 2009. Mr. Guy was a co-editor for the book “Construction Ecology,” and co-author of a book on building deconstruction titled, “Unbuilding: Salvaging the Architectural Treasures of Unwanted Houses”. Mr. Guy also wrote the on-line “Design for Disassembly in the Built Environment” guide for King County, WA. Brad has a MS in Architectural Studies from the University of Florida, and a B.Arch. from the University of Arizona. He is an Associate of the American Institute of Architects and an USGBC LEED® Accredited Professional. Summary: Recover. Reuse. Redesign. Fort Ord panelized deconstruction. Technology and technique exploration from deconstruction efforts. Knowledge generation. Impacts of building materials. Ecological rucksack. Reasons for building demolition. Regenerative design. Drive towards what’s beautiful. Information technology to support building reuse. Design for flexibility. Nothing endures but change. Ms. Beach is a published writer and national speaker on architectural ethics, serves on the AIA National Ethics Council, and was a Harvard Ethics Center Faculty Fellow. She has degrees in Political Philosophy and Economics from Yale and in Architecture from Harvard, where she taught building, landscape, and urban design, history, theory, and ethics. Victoria is a winner of the AIA Young Architect Award, the principal of her own architecture firm, and the founder of Design Foundations, a nonprofit matching aspiring architects with pro bono projects in under-served communities. She was elected to Carmel City Council in 2012. Charles Bohl is an associate professor and director of the Masters in Real Estate Development and Urbanism (MRED+U) program at the University of Miami’s School of Architecture. Dr. Bohl is an expert on place making, community building and mixed-use development. He is the author of Place Making: Developing Town Centers, Main Streets and Urban Villages, a best-selling book published by the Urban Land Institute (ULI) now in its 5th printing. Dr. Bohl currently serves as the Chair of the Congress for the New Urbanism’s Florida Chapter and as a member of the Executive Committee for the ULI Southeast Florida/Caribbean District Council. Dr. Bohl holds a doctorate in city and regional planning from the University of North Carolina at Chapel Hill. He lectures and consults widely in the U.S. and abroad. Summary: How complete planning affects prosperity through the prism of placemaking. How complete places affect community prosperity. Enduring, resilient. Places that grow in value. 5 senses that define a complete community. Changing demographics. Design patterns changing to meet changing demands. Office parks out of date. Attracting the creative class. Role of technology in lifestyles and society. Quality of place: What’s there – built & natural environment; who’s there; what’s going on. Design guidelines & standards. Incremental placemaking. Connect develop with local industries. Mix housing types. Public realm creates value. Street design. Build models. Make detailed drawings. Look at best examples for inspiration. College town plan. Sustained leadership. Design centers. Select right development team. Victor Dover is principal in the town planning firm of Dover, Kohl & Partners. His practice focuses on the creation and regeneration of sound neighborhoods as the fundamental component of livable communities. Victor holds degrees from Virginia Tech and the University of Miami, and is credentialed by the American Institute of Certified Planners. He was a charter member of the Congress for the New Urbanism, and currently serves as CNU’s national chair. He is the author of the “Streets” chapter in the Charter for the New Urbanism book. He served on the core committee that established the new LEED for Neighborhood Developments (LEED-ND) standards. Victor is a Fellow of the American Institute of Certified Planners. He's also a veteran marathoner and Ironman triathlete. Summary: Drawing lines on a map that reverberate through history. Growth & change can be good. Decide what you want then work towards the goal. Street design: architecture, spacemaking, wholeness. Design for change over time. Think like a movie not like a map. Planning is a verb. Make addresses. Recycle streets. Transit oriented development. Livable communities. Creative class. Street oriented approach to retrofit: Shape – height to width ratio; Comfortable – climate adapted; Connected – integrated network. Mr. Congleton received his Architecture Degree from the University of Colorado in 1970, and is licensed in Colorado and California. He has been providing architectural services since1975, master planning and designing commercial and community facilities, multifamily housing, historic preservation and renovation of existing properties. Congleton has supplemented his architectural practice with community involvement, serving multiple Boards in the Carmel region. Summary: Value of reflection on project quality. Planning takes time. Bill Lennertz, AIA, is Executive Director of the National Charrette Institute. Bill is a principal author and lead trainer of the NCI Charrette System™, the first structured approach to design-based collaborative community planning. Since he co-founded NCI in 2001, Bill has trained top staff from various organizations including the US Environmental Protection Agency, US General Services Administration, US Department of Housing and Urban Development, Fannie Mae Foundation, and Departments of Transportation in Oregon, New York, and Arizona, as well as many private planning firms across the country. Bill co-authored The Charrette Handbook, published by the American Planning Association, is the co-editor and essayist of Towns and Town-Making Principles, a monograph on DPZ, and a contributor to the Charter of the New Urbanism. Bill has taught at various universities including Harvard, where he received his Masters of Architecture in Urban Design and now annually teaches the NCI Charrette System™ certificate course. Summary: Portland is cool. 3 pillars of holistic community development: Principles: Sustainable Design, Standards: Form-based Codes, Process: NCI Charette System. Creative solutions. Short period of time to dig into your creative center. Good things come from a good plan and not quite enough time. Opportunity of conflict. Charette roles and process. Multi-disciplinary team of design/planning professionals. Stakeholders. Multi-stage. Short feedback loops. Everybody involved at the right time. Charette systems approach. Stefan Pellegrini is an architect, urbanist, and planner who serves as program lecturer and professional liaison in the College of Environmental Design's Master of Urban Design program. During his career, Stefan has contributed to a wide variety of urban design, planning, and architecture projects, including the design of new towns, master planning and revitalization endeavors for central cities, and the design of mixed-use and civic structures. Much of his recent work has focused on community-based planning, coding, and revitalization strategies for small towns and underserved communities, as well as the development of contemporary urban design guidelines and Form-Based Codes. Stefan has worked with Opticos Design, Inc., since 2001, where he serves as principal. His professional and academic work has won numerous awards, including an Urban Design Travelling Fellowship from the Skidmore Owings & Merrill Foundation (2002), the Chicago Institute of Architecture and Urbanism Award (with Professor Peter Bosselmann, 2002), and the Driehaus Form-Based Coding Award (2008 and 2011). He studied architecture at the University of Notre Dame and urban design at UC Berkeley. Summary: Form-based codes. Solve disconnect between policies and what gets built. Shift towards walkable urbanism. Zoning has come a long way in 16 years. Health, climate change driving forces for walkability. Form-based code yields great value (as in Nashville, NC). FBC use physical form as the organizing principle for zoning. Transects. Evolving regulatory focus. Breaking down silos to enact new form-based codes. 500 FBC adopted or in process in the US. 3 Big ideas for FORA: Create walkable places; The Transect as a Platform (across jurisdictions); Standards as Templates. Doug Walker, president of Placeways, is a nationally recognized leader in innovative planning and visualization software. He is best known for CommunityViz®, the widely used planning software his company creates. His practice also encompasses public engagement, planning services, and interactive web applications that support informed, collaborative planning for communities and regions. Drawing on more than 25 years of career experience in connecting people with technology, he is active in industry forums and frequently speaks, writes, and teaches about next generation planning techniques and technology. David L. Spaur brings nearly 25 years of executive experience in the community and economic development field to his position as Economic Development Director for the County of Monterey. He has been an economic development director with the city of Sacramento, Placer County and the city of Mesa, Ariz., as well as leadership positions with non-profit economic development organizations in California and Arizona. Mr. Spaur served on the Workforce Investment Boards of Fresno, Merced, Placer, San Luis Obispo and Stanislaus counties as well as Coconino and Maricopa counties in Arizona. Mr. Spaur has a bachelor's degree in planning and development of rural environments from California State University, Chico and has completed post-graduate certificate programs. He has served on the Boards of the California Association of Economic Development, the International Economic Development Council, and has chaired the California Central Coast Marketing Team. Douglas Farr is the founding principal and president of Farr Associates, an award-wining architecture and urban planning firm identified by the New York Times as "the most prominent of the city's cadre of ecologically sensitive architects." Farr Associates holds the unique distinction of being the first in the world to have designed three LEED Platinum buildings. Doug is on the board of the Congress of the New Urbanism, serves on the BioRegional Development Group board of directors, and was the founding chair of the LEED for Neighborhood Development project. Summary: Principles for sustainable development. Dockside Green B.C. Development examples of green building from around the world. Go ahead with aspirational models. Uptown Normal, IL. Exercise leadership. Jim Meadows is a consultant for non-profits, global development firms, federal contractors, federal agencies and state redevelopment authorities, with concentration in four disciplines: Non-profit strategic planning; base realignment and closure development planning; feasibility and land planning; and mixed-use master planned development pre-planning. Jim is the past President and Board member for the Association of Defense Communities; Regional Coordinator for the US Department of Commerce; Executive Director of the San Francisco Presidio Trust; and Executive Director for the Lowry Redevelopment Authority, among other positions. Jim was a Captain in the US Air Force from 1967-1971. Summary: Presidio of San Francisco redevelopment. Practical environmentalist. Long-term maintenance cost and planning. Open space planning. Finance. Presidio was own Master developer. Lowry Air Force base in Denver & Aurora CO. Urban site. Live, work, learn and play. Fully integrated community. Recreation and open space in economic recovery. Similarities and differences between Presidio and Fort Ord. Presidio Case Study. Public access. Try things. Anchor new development. Hold out for quality development. Luther has co-authored three books, including Balancing Nature and Commerce in Gateway Communities, published by Island Press. In addition, Luther serves on the boards of the George B. Storer Foundation, the Conservation Lands Foundation, the International Mountain Bicycling Association, Carpe Diem West, and the Lincoln Center for Applied Ethics at Arizona State University. He has previously served on other boards, including High Country News and the Arizona League of Conservation Voters. Summary: Public awareness and concerns are variable. Creation of National Monuments is “potential” economic drivers. Tourism overrated as strategy for creating economic value. Key to extracting value form presence of National Monument is the existence of the “knowledge economy”. Attract smart folks with the presence of recreational attraction and high quality of life. Characteristics of attracting highly skilled workers to communities. Conditions for National Monuments helping attract highly skilled workers. Branding and marketing.